Posted on April 25, 2019 by Smorgasbord - Variety is the Spice of Life. Another letter that I wrote home to my parents when we lived in Houston Texas from 1985 to 1987. It is now April 1986 and I wrote this particular letter on April 27th, so almost 33 years ago to the day. Another letter from the far flung corners of the globe and unusually for me I am full of cold… must have been drinking out of damp glasses again! It has been an unsettled week. As you know we look after Walter’s cat Sutherland when he is on a long shift or away and we are very attached to him. He is sometimes allowed out in the exercise yard and always comes home, but he went missing a few nights ago and we have been out searching for him several times a day. He was spotted in the company of another cat yesterday and he may be co-habiting somewhere with a lady friend. I hope he is okay we miss him.. he is such a character. David did very well in his race on the Saturday before he left for the UK.. he came 363rd out of 2000 runners so is very pleased. He will carry on with his training and I expect he will be in a full marathon one day soon. He is currently luxuriating in his tiny hotel room in Manchester and he should have phoned you by now. He has been very busy with meetings and having discussions with his boss on the subject of his return to the UK or an extended stay here. Once he gets back we will have a definite answer and we can make our plans. I think it is likely that they will offer him a position back in Prescott, and we will have to discuss whether we want to return to that part of the UK. We know it well and we do enjoy having access to the Welsh mountains and coast for the weekends. It will be tough adjusting back to the weather though, I have got very used to being in the sun and swimming 8 months of the year. My friends here have rallied around whilst David is away with Walter and Anna for supper on Monday, Debbie came over last night to watch a movie and tonight Pamela and I are off to the cinema. I am also thrilled to say that the first tomatoes have emerged on the four plants on the balcony.. I now have five that are beginning to ripen and David will enjoy those in his sandwiches he has every day at work. He has some leave due and we thought we might take a few days break. A road trip as he has had enough flying for a while. We might go down to Florida for a bit of Miami Vice!! We have passed through the north of the State but never explored fully.. Having watched some of the nature programs on the television I am not too sure about the everglades… snakes, alligators and such! You know me and snakes. Once David returns and we have firm news I can let Sonia know and she can book Emma’s ticket. I have lots of ideas for the three weeks that she is here and everyone is very excited to meet her. She won’t have time to draw breath and hopefully we can keep a 15 year old entertained as there are no other teenagers of her age here in the complex. Our friends who have lived here all their lives have come up with a list of ‘top attractions’ and we will take their guidance very happily. I am off now to sit in the sun and watch my tomatoes grow.. hopefully my cold will have run its course by tomorrow and I can go back to my daily swim. At least my tan makes me look healthy……. love and hugs as always… S & D.
Posted on April 24, 2019 by Smorgasbord - Variety is the Spice of Life. Debby Gies has been scanning the airwaves for videos to share… here are some more that she has come across.. ..D.G. Kaye Writer Blog is where you will find an archive full of wonderful posts across several subjects including writing tips, social issues and book reviews. This collection of experiences, told mainly in the form of questions and answers, from twenty authors and bloggers, is a unique and emotional read. Each of the twenty participants has been through a traumatic time in their lives and each of them has overcome their particular set of circumstances, whether it is a struggle with cancer, sexual abuse, the loss of a loved one or a personal obsession gone wrong. Despite its emotional and heart wrenching content, this book is, on the whole, an uplifting read as well as being an enlightening one. I was impressed and encouraged by each of these writers ability to overcome their personal hardship and find a successful path forward. I commend all of these authors and bloggers for their courage and honesty in writing their personal stories to help and encourage others who many be facing similar situations. The next contributor to the anthology is Clive Pilcher who was diagnosed with clinical depression and shares his eventual recovery including Cognitive Behavioural Therapy. Clive was not diagnosed until his 60s and he looks back at this life and the possible triggers for his depression and later panic attacks. He also gives some valuable insights into what we should be aware of as possible indications that we are coping with life as much as we might appear to. I retired in September 2013 from working in the NHS, for a large mental health Trust in London. I am a Man of Kent, exiled for many years in Essex, but am content in my adopted county. I love books, both real and electronic, and listening to music both at home and live – particular favourites are what might be termed folk, rock, Americana and alt-country. I also watch a lot of sport on TV, especially football and cricket, and am a long-time supporter of Dover Athletic, my home town team, and after retirement I became a season-ticket holder at my local team – Leyton Orient. Sadly, I’ve had to give that up, for health reasons, but am hopeful of renewing again at some point. The next contributor is Abbie Johnson Taylor who is an author of a romance novel, a memoir and two poetry collections. She had only been married for a few months when her husband suffered a stroke and Abbie became his full time carer. In her article, Abbie shares the challenges for a sight impaired person to care for another, particularly with mobility challenges. She did so for six years with some home help, but it required round the clock care, including many sleepless nights. It is inspiring considering the effort required and the commitment to caring for her husband at home. I live in Sheridan, Wyoming, where for six years, I cared for my late husband Bill, totally blind, who was partially paralyzed by two strokes soon after we were married. Before that, I was a registered music therapist and worked for fifteen years in a nursing home and other facilities that served senior citizens. I have a visual impairment, and during this time, I facilitated a support group for others like me. I also taught braille and served on the advisory board of a trust fund that allows persons with blindness or low vision to purchase adaptive equipment and services. The next contributor is Stevie Turner who wrangled those of us who contributed to the anthology, and compiled and produced the collection. She was asked her questions by fellow author and contributor Miriam Hurdle. Stevie is a thyroid cancer survivor and she shares the initial finding of a small lump that developed into stage IV requiring many operations and radiation treatment. It returned in 2007 and 2014, but Stevie is confident that following her final surgery and treatment she is now cancer free. The final contributor to the anthology is author Beem Weeks who shares his addiction to alcohol, the development from social drinking to dependence and the near death experience that resulted in his 18 years of sobriety. It is an article that everyone will find thought provoking as drinking is a large part of our lifestyle and in some cases our identity. Beem Weeks is an author, editor, blogger, blog talk radio host, video producer, and social media director for Fresh Ink Group. He has written many short stories, essays, poems, and the historical fiction/coming of age novel entitled Jazz Baby. Beem has also released Slivers of Life: A Collection of Short Stories and the recently published Strange Hwy: Short Stories. Apart from two years spent in Ft. Myers, Florida, Beem is a lifelong native of Lansing, Michigan, USA. A selection of books by Beem Weeks. I hope you have enjoyed meeting the contributors to this anthology, who have shared some very intimate glimpses into their lives and the challenges they have faced. Here is the full list of contributors and you can read the posts by clicking on the link at the top of the page to the previous post. Verb- To think or argue in a logical manner. To form conclusions, judgments, or inferences from facts or premises. But unfortunately, just because you have the right to worship your god, does not mean those who worship another, are not going to find a reason persecute you for it. It has become a tragic fact of our modern world, that a handful of extremists believe that they have the right to commit violence because of differing beliefs. Radicalisation of the young, vulnerable and poorest elements of society goes against any true religious teachings. The cornerstone of most religions, including those that have a radicalised minority, is peace, mercy and harmony with others. To that end certain rules or commandments were laid down long ago that attempted to ensure that peace and harmony existed amongst the believers as well as those outside the religion. For example, the Ten Commandments in the Old Testament were carved in stone and instilled in the faithful are an ancient example of this. The story of how Moses came into possession of these commandments is a Sunday School favourite, but however they were introduced, their intent remains the same. I am not a religious expert, but I believe that most religions have something similar in their teachings. The dark side of the commandments…. Apart from the benevolent aspect to these commandments, there is also the element of control it gave leaders of religions over their flocks. It enabled them to wield power and a reason to demonstrate their power if you failed to fall into line. Let’s face it, if you want to manage thousands of people, what better way than to develop a stick and carrot approach to their devotion.Some high priests even persuaded the members of their gatherings that it was an honour to be chosen to be sacrificed and to go straight to the land of the gods. Something that unfortunately is making a comeback. There are more subtle but equally effective ways to maintain control, including using an ancient language that nobody understands for all your religious services, maintaining the mystery for hundreds of years! A congregation had no reason to question the teachings or rituals performed generation after generation. Certainly those that did question such practices and the breaking of most of the commandments could have dire consequences, usually ending in death. In some countries it still does! Sometimes just an accusation of breaking the commandments could result in death, and religious courts were not known for mercy, including the Inquisition which began in 1478 and lasted 350 years. Even the law has taken these commandments very seriously and has used them as a reason to remove unwanted members of society. Stealing a loaf of bread for your starving family was not seen as an adequate reason, and could find you on a boat to Australia. Even in our lifetime, these very commandments intended to create a harmonious society we could all live within, have been broken numerous times by governments, including inciting two world wars and genocide. If somebody does not believe in our rules…. then they must be in the wrong! We are allegedly the most intelligent species on earth with a capacity to reason. This means resolve issues logically, with knowledge gained or discovered, with awareness of consequences and with a positive outcome in mind. But that only works if there are not people in power willing to manipulate the truth for their own means. And never easier than today, with the world wide web at their disposal, to disperse their agenda to millions of receptive individuals. Most of us like to think that we can reason things out for ourselves, but we are being manipulated in most areas of our lives from the food that we buy, the utility company we use, the clothes on our back, who we vote for, whether we vaccinate our children or not, our body image and crucially who we want excluded from our society. Some examples of how a population can be manipulated. Brexit and the fear campaign in the press and social media by those in power on both sides of the divide. The leavers managed to get a 52% victory over the remainers at 48% by hitting the voters with the disadvantages and horrors of staying within the EU. Brussels would continue to control our legal system and force new draconian laws on us as a nation. Brussels would impose more regulation on our lifestyle from capping the power of vacuum cleaners, the price on beer, to the wattage of our light bulbs. That the open borders meant that UK jobs were in danger from migrant workers from the EU and a massive increase in unemployment and billions on the welfare bill. That open borders encouraged more immigration from non-EU countries putting a huge burden on services such as the NHS. That the UK would be impacted by the financial issues in other EU countries such as Greece. That the European parliament was a massive black hole that cost billions annually to support. And most compelling was the argument that the British were losing their identity, something that they had fought hard for during two world wars. There was already a dislike of the leaders of the EU who were portrayed in the press as treating our own politicians with disrespect. There was also the fear that Britain would be absorbed into the union and be governed by countries that were traditional enemies. The price of holidays in Europe will go up substantially. Telephone charges when on holiday will go up. The cost of importing cars, electrical goods, our gas, French wines and cheese would cost £100s more each family per year. Everything from medicines to toilet paper would run out (people have already started hording). Food would only last a week. Tourism would drop in the UK as it would become too expensive for visitors. We would have to pay billions to the EU as part of the divorce package that was money needed to bail out the NHS. There would be a hard border between Northern and Southern Ireland which could result in damage to the peace process. There would be a loss of the European cross border co-operation on policing, terrorism etc putting the UK at risk. The UK would be unable to secure trade deals with non-EU partners to make up the shortfall from current deals. We would be militarily isolated should there be a need to defend the UK in the future. Now after three years of shambolic negotiations we seem to be at an impasse! The British public were not given all the facts to make an informed and reasoned decision before the referendum that was called too early, and they were spoon fed a fear campaign based on their lifestyles and personal pockets. The world is a small place for someone who can’t read. Basic signage, medication labels, job applications: They all become inaccessible, and the chances of a healthy and productive life are slim. Life expectancy increases as a result of literacy and the United Nations considers it a human right. There are 775 million people in the world who are illiterate, with another 152 million children set to follow in their footsteps because they aren’t attending school. 1. 32 million adults can not read in the United States equal to 14% of the population. 2. 21% of US adults read below the 5th grade level. 3. 19% of high school graduates can not read. 4. 85% of juveniles who interact with the juvenile court system are considered functionally illiterate. 5. 70% of inmates in America’s prisons can not read above the fourth grade level. 33.7 million voted in the Brexit referendum with 52% (17.4m) voting to leave and 48% (16.1m) to remain. A close vote. The number of eligible voters in the UK is 46 million which means that 12 million did not vote. We will never know if the 7.1 people in the UK who have poor literacy skills voted or not. But with only 1.3 million disparity, it might have changed the outcome. Now there are millions who have changed their minds and say that if they had known the facts at the time they would have voted to remain! Hindsight is a wonderful thing but truthful communications from those in power is also a rare commodity these days. This post was about reason…. as a justification for our actions, our attitude to those who do not believe in the same god as we do, and also as a tool to determine our personal and national futures. We have rules and we might consider that most of them are archaic or unsustainable but the basic ones were designed to ensure social harmony and it is our responsibility to abide by them. That being said…. it is those in power who are the most guilty of not abiding by these basic laws as they find it easy to manipulate them for the wrong reasons. When it comes to determining our own future and that of our countries, we need to be as informed as possible before voting for political parties and participating in referendums that will have critical consequences. And if we are to demand that people make informed decisions about their own lives and the direction their country is heading, there should be considerably more resources made available for education, not just for children but the millions of our populations who are functionally illiterate. More education is also required on the necessity to vote in major elections or referendums. I would be very open to it becoming a required action without a justifiable reason for abstaining! It also means not taking anything we hear or read at face value. Asking questions is part of the reasoning process and we all need to take better advantage of any opportunity to do so. These views are entirely my own and are not intended to offend anyone’s religion or political preferences.. but I am sure it will result in some discussion… thanks Sally. I originally shared this post two years ago and I wanted to update it with any new reports to support this surprising perspective on the salt we consume in our diet. One of the first points that I want to make is that I am not suggesting that you consume industrialised foods that contain not only high levels of sodium but also many other additives that do not do your health any good at all. I am very much in favour of a ‘Cook from Scratch’ philosophy when it comes to our food, especially when cooking for young children, in which case you are the person who controls how much salt is consumed through cooking and supervising what is added to meals. I have been a nutritional therapist for over 20 years, and one of the essential elements of my work has been to remain informed of new research as it becomes available. This has sometimes turned previously held beliefs on their head, and a number of experts and research studies do make us reassess our position on salt in the diet. However, if this research is to be believed, I may well have been going about this the wrong way by reducing my salt levels too far. I have read several articles written by Dr. DiNicolatonio and I am sharing excerpts from two that I suggest you read and consider. I am not suggesting that you suddenly dive into the salt pot and certainly not to stop taking any medication. I am however excited to discover more about this line of research and will be keeping an eye on other studies. The Salt Fix by Dr James DiNicolantonio, was published by Piatkus Books in 2017 and is now in Kindle. One of the reviews for the book from a physician. DoctorSH 5.0 out of 5 stars No longer in fear of salt! I just finished the book, The Salt Fix by James DiNicolantonio. Well worth the read. As a prevention and wellness family physician who prides himself in looking deeper at cause and effect in healthcare, I must admit that I had my blinders on when it came to salt. I too believed that salt was to be watched closely and tried to remain at the lowest recommended usage. Well, no longer! The author James DiNicolantonio makes a great case as to why limiting your salt to the national guidelines may be BAD for your health. In my practice, I have different views than mainstream medicine in many areas of health and wellness. Why? Well, I have arrived at the point in my career when I am not afraid to ask the “experts”- “WHY?”. Why is fat bad? Why is cholesterol bad? Do cholesterol lowering drugs really save lives? I like to dive deeply into cause and effect. But it appears like I did not look closely enough at how the human body uses salt. I was still advising people to watch their salt intake as I thought that the dietary recommendations were set in stone with irrefutable evidence. Well……. Let me add one more question for the “experts”. Why is consuming more than 2 grams of salt a day bad? After reading The Salt Fix, I am disappointed in myself but that changes today. The author James DiNicolantonio very simply makes the case that the war on salt is as misguided as I believe the war on cholesterol and fat has been. He points out how salt is a vital nutrient that our body needs to stay in balance, just like fat and cholesterol. He clearly and simply shows how our body responds to different levels of salt intake. He brings together many other aspects of my practice, writing about how it is not salt, but that other white processed powder, SUGAR, that is really the issue in most people with metabolic health issues. He points out how sugar can cause insulin resistance leading to Obesity, High Blood Pressure, Diabetes, Heart Disease, etc, etc. He then shows how too LITTLE salt also leads to insulin resistance, Obesity, High Blood Pressure, Diabetes, Heart Disease, etc, etc. See the twist? Besides learning about the many beneficial aspects of salt, this book should make you a more skeptical thinker when it comes to national dietary guidelines. You should ask yourself, “Is there real proof that these guidelines are good for my health AND were these guidelines based on real medical studies or are they a dietary or political/industry power play? If you are overweight, have High Blood Pressure, Diabetes, Thyroid Disease, or Kidney Disease, BUY THIS BOOK and READ IT. If you like salt but are afraid to use it, BUY THIS BOOK and READ IT. Then have a conversation with your physician(s). If they just restate the National Dietary Salt guidelines without understanding the true data, lend them this book, or buy them one so they can refer to it and help more patients. “Salt has been the subject of controversy in recent years, and has increasingly been blamed for a number of poor health outcomes, such as high blood pressure, heart disease and stroke. (1) Salt is ubiquitous in our modern diet, with Americans consuming an average of 10 grams of salt per day. Of this amount, about 75% is derived from processed food; only about 20% is naturally occurring or from discretionary salt use, such as that added in cooking or at the table (the rest comes from sources such as water treatment and medications). (2, 3) Most of what we read and hear about salt these days is telling us that salt consumption needs to be reduced, and it has even been referred to as “the single most harmful substance in the food supply”. Chris Kresser, M.S., L.Ac., is the creator of the ADAPT Practitioner and Health Coach Training Programs. He is one of the most respected clinicians and educators in the fields of Functional Medicine and ancestral health and has trained over 1,300 health professionals around the world in his unique approach. Robbie Cheadle with her review for Understanding… an anthology of true and significant life events compiled by Stevie Turner.. 19 authors share their experiences. You don’t realise how many people you dislike until you have to name a baby! When you really want to slap someone, so so and shout ‘Mosquito’! I cook with wine, and sometimes I even add it to the food….. I hope that you are leaving with a smile on your face… only four days to go to Friday! Author Amy Reade with her interview of Cindy Davis… please follow the link to read the entire interview. Today I welcome author Cindy Davis to Reade and Write. I met Cindy on Twitter and was drawn first to the descriptions of her mysteries. As I learned more about her, I found that she also writes non-fiction books on topics ranging from self-editing to online dating to small dog breeding and more. She is originally from New Hampshire, but now enjoys living in Florida. So let’s get started. Tell me about your mystery books. 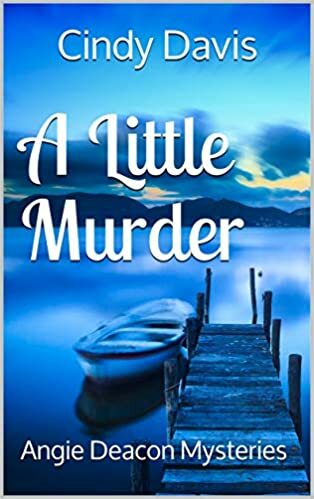 A Little Murder is the first of my 6-book series set at Lake Winnipesaukee, NH. Angie Deacon is a high-maintenance ER nurse who buys a day of fishing for her husband’s birthday. A murder on the boat causes her to learn things about herself that were probably better off not brought out in the open. Who is the audience for the series? discover more about Cindy Davis and her books by following the link.